Myeloma cast nephropathy, also known as light chain cast nephropathy or myeloma kidney, commonly presents as acute kidney injury, and is one of the most common kidney manifestations of multiple myeloma. Urinalysis detects non-nephrotic range proteinuria because most of the proteinuria is primarily due to light chains (Bence Jones protein). The patient might have an identifiable precipitating factor, e.g., volume depletion, hypercalcemia, diuretics, nephrotoxins, and infections. Kidney biopsy is necessary to confirm the diagnosis. On histopathology, the disease is characterized by formation of abnormal casts in the distal tubules of the kidney. The casts appear fractured in appearance and are formed by the combination of Tamm-Horsfall protein and monoclonal light chains. The casts can lead to obstruction and cause direct toxicity to the tubules. The casts appear eosinophilic with hematoxylin and eosin (H&E) stain, pale or negative on PAS stain, and are polychromatic (red and blue) on the trichrome stain. The casts may have variable geometric shapes and may be surrounded by epithelial cells, giant cells, or inflammatory cells. There can be accompanying interstitial inflammation. On immunofluorescence (IF), the casts are restricted for either kappa or lambda light chain; kappa is more commonly seen than lambda. In cases with no casts on frozen IF tissue, IF can be performed on paraffin tissue. On ultrastructural evaluation, the casts have variable appearance with non-specific substructure formation. Post prepared by guest contributor Shree G. Sharma, MD. Figures from Lusco et al, AJKD, © National Kidney Foundation. 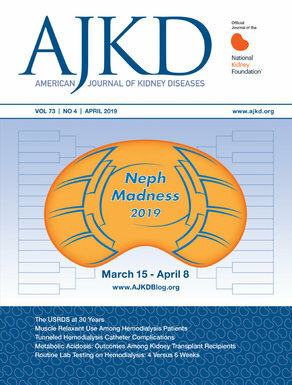 Please visit the Atlas of Renal Pathology II (freely available) at AJKD.org for related installments on this and other topics. Interesting read pertaining renal pathology. The slides photos are very clear.